Hindu extremists increasingly trying to frame pastors. 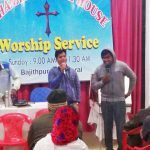 HYDERABAD, India (Morning Star News) – After being framed on false charges earlier this year, two Christians in eastern India recently spent a month in jail, where inmates beat them after discovering they were accused of defiling Hinduism, sources said. 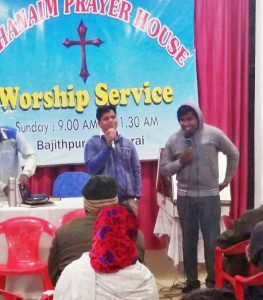 Months after two Hindu extremists in Bihar state tried – and failed – to trap pastor Ajay Kumar and a Bible college student into actions that would serve as the basis for fraudulent conversion accusations, charges are still pending against the two Christians. On March 17, the 32-year-old pastor was visiting a church member’s house in Begu Sarai District, where he leads his Assemblies of God church, when he received a call from an anonymous person at around 11 a.m.
“The caller told me that he really wanted to know about Christ and asked us to meet him at Har Har Mahadev Chowk,” Pastor Kumar told Morning Star News. The Christians told them that if they wanted know about Christ, then they would share the gospel, but that they don’t convert anyone. The pastor told them that they don’t do marriages and didn’t want to be involved in the matter. The Hindu extremists began shouting, “Stop conversions,” and that they would not tolerate “foreign activities” in India, he said. Protesting outside his church facility, they shouted, “Stop giving money and converting Hindus,” and, “We can even kill you,” he said. With the help of attorneys, the Christians filed a petition for anticipatory bail to prevent arrest, Bob Raj, senior pastor of Assemblies of God-Patna, told Morning Star News. On Sept. 14 a lower court judge issued an order stating the case “seems to be fit for regular bail.” At the same time, police were unable to find any evidence for the allegations, so the legal team decided to pursue regular bail, Pastor Raj said. “Since the local lawyers advised us that the court can issue a regular bail in case an arrest is made, Ajay and Asharya appeared before the Chief Judicial Magistrate on Nov. 2, and surrendered before the court of law,” he said. “Amazingly, after 10 days of observing us pray and meditate, they understood that we are framed in a false case,” he said. On Nov. 29, the two Christians’ case came up for hearing before the judge who had earlier stated it was fit for regular bail, and he ordered the Christians released, he said. “There are two options for them now,” Singh said. “Since the charges are false, they can appear before the court for the next hearings, and ultimately they will be acquitted, or they can go to the High Court in Patna to submit a petition to quash the FIR [First Information Report],” Singh said.